I am a painter first, and a teacher second. I have taught for 17 years, while raising two children. During most of that time I was a Sunday painter. But in the past few years, as my children have grown up and become more independent, I have been able to paint on a more regular basis, that has become routine for me now. And for the last two years, I have built up a body of work that I feel very proud of. I am an abstractionist that dabbles in the representational. Deep meditation and reflection on past works that I did in encaustics 20 years ago has given me new insight on the creation of painting and the process of brush stroke and color fields. My investigations into this process have allowed my paintings, both past and present, to have an open dialogue with one another and a continuum. 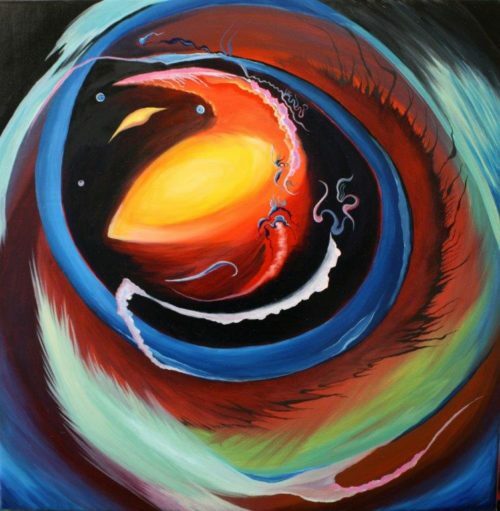 My work has evolved, over time, from a highly narrative figurative style into abstract painting laced with symbolism. There is still narrative, but I want it to be broader. This work is speaking about energy in nature, and the subtle or strong forces working beyond the human realm. Some work deals with microorganisms and some deal with deep space. All deal with the beauty and dichotomy of those worlds in their complexity or simplicity.